The theme of this year's conference was, 'The Christian Church: Its Mission in a Post-Christian Culture'. Timely, what with the church in the UK struggling to adjust its mission to a more secular climate. A session was devoted to discussing each paper in turn after a word of introduction by their authors. We then divided into small groups to chew the fat, before coming together to feed back to the whole conference. 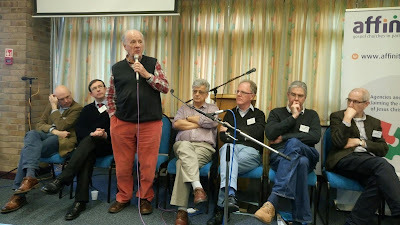 A speaker was delegated to each discussion group, meaning we all got to 'grill' one, which was nice. (Maybe not so much for the authors). There were some points of disagreement. In his paper Chris Bennett argued for the Chris Wright view that the mission of the church should reflect the mission of God to restore and renew the whole universe. He questioned the distinction that is sometimes made between what may be done under the auspices of the organised church and what is a matter for individual believers. The distinction has its uses, however. Churches may organise things like Parent and Toddler Groups to foster links with the local community as well as run directly evangelistic activities, but it is down to individual believers to get involved in local politics, or help with urban redevelopment projects. They do so as members of the organic church and with the prayerful support of their local fellowship, but such activities are not in themselves an expression of the mission of the organised church. That's what I reckon, anyway. Another thing was the extent to which we should make use of the diminishing heritage of Christendom. Most agreed that we should use our Christian heritage as a point of contact with the unbelieving world. But our primary purpose is not to preserve this at all costs. Contrary to Anglican friends (and some inconsistent Nonconformists) I don't believe we should retain Bishops as ex-officio members of the House of Lords, or the Monarch as Supreme Governor of the Church of England. Let Church and State be separate, each with its own sphere and mission. That does not entail a faith-free public square, but in Augustinian terms, the City of God should not be confused with the City of this world. The papers and discussion that arose from them were certainly thought provoking. A good mix of theological reflection and cultural analysis that helped us to apply biblical truth and lessons from church history to contemporary concerns. It is only as we do that will we be able to equip the church for its God-given mission in a secular world. The papers will eventually be published in book form, so I'm not going to provide a summary here. The 2015 set are available under the title, In Christ Alone: Perspectives on Union with Christ, and very good they were too. One of the joys of a conference like this is the times of informal chat and discussion that spill over into coffee breaks and meal times. That's where you get into the practical nitty gritty of how to work out all this stuff in the context of church life. You may also find yourself engaging in discussion of whether holding that ensoulment is not from conception implies an Appolinarian moment in Christ's incarnate life. Or watching some of the most ineptly played games of Pool you're ever likely to witness. Despite me not being quite so active on the blogging front these days, some of the delegates were familiar with this here blog. More familiar than me it seems, as I had no recollection whatever of posting this in response to Ruth Palgrave's criticism of Affinity a few years ago. Must be getting old. The next Affinity Theological Study Conference will be in 2019, on the theme, 'Worship'.